Imagine the thrill of transporting Charlotte Mason through time and space to our 21st-century society. (Personally, I am often in sore need of an encouraging word from this grande dame of education.) Frustrated teachers, parents and politicians grappling with the failing school system could benefit enormously from her views. Perhaps, she could reveal to them why children are failing to become life-long drinkers from the trough of knowledge. Before embarking on such an incredible journey, Charlotte would kindly protest for, if we have learned anything from her, it is that books are "the storehouse of thought wherein we may find all the great ideas that have moved the world." Vol. 2, pg. 231 We need only to turn the pages of her legacy to learn her thoughts on living ideas and view our current educational crisis through her great mind. If we were able to convince Charlotte to spend one day in the shoes of typical young scholars, she would be mentally famished by the starvation diet foisted on them. Their minds slowly turn to mush through television, music and video games, chock full of insipidness and devoid of nourishment. Modernizing one of her passages, she might mournfully reflect "a glance at couch potatoes watching television (you may substitute the phrase 'ravers enraptured by rhythm' or 'gamers gunning their joysticks') makes us wonder what sort of mind-food those young people are sustained on, whether they are not suffering from depletion, inanition, not withstanding big and burly bodies." Vol. 6, pg. 104 While their minds gorge on the empty calories of popular culture, so too, their "big and burly bodies" consume massive quantities of junk food, leaving them mentally and physically malnourished. While I could show Charlotte some advantages to witnessing exotic lands, historical events, and scientific exploration through the eyes of a motion-picture camera, she might notice the disadvantages as well. To acquaint her with modern cinema, I show her filmed versions of literary classics. We would be distressed to miss beloved characters, favorite scenes and rabbit trails deleted in the transformation from book to film. I confide to Charlotte my disappointment in losing Stuart Little's invisible car and feathered friend Margalo and the mermaid's Christ-like-sacrifice in The Little Mermaid. The substitution of a sugar-coated sap for the naughty puppet in Pinocchio makes his induction into the humanity club anti-climactic. The live-action version of Collodi's classic retained some of the puppet's wickedness, but the noble message of obedience and sacrifice was replaced by Hollywood's faddish devotion to the theme "love conquers all." Just like creating outlines and textbooks, turning books into screenplays requires abridgment and deadening changes, robbing a story of some of its vital essence. Even in Lord of the Rings, a movie in which the director tried to remain true to the epic, the characters of hobbits Merry and Pippin were shallowly developed and Glorfindel's role was blended with Arwen's. I never did understand it, and when I went to see Snow White and the Seven Dwarfs again, with Carol Crane, I warned Carol that Mr. Walt Disney hadn't read the true story. I didn't yell at the movie screen. But I still wished I could have seen the Evil Queen dancing to death in those red-hot iron shoes. After observing the higher quality movies of our time and the few hours children spend reading living books, Charlotte might conclude, "The education of the day, it is said, does not produce reading people. We are determined that the children shall love books therefore we do not interpose movies between the book and the child." Vol. 2, pg. 23 "We are in such haste to be instructed by documentaries or titillated by movies that we have no leisure to linger over the mere putting of a thought. But this is our error, for words are mighty both to delight and inspire." Vol. 2, pg. 263 She might encourage us to pry the eyes of our children off movies and glue them onto books. "The best thought the world possesses is stored in books; we must open books to children, the best books; our own concern is abundant provision and orderly serving." Vol. 2, pg. 26 If only the powers in control of our educational system would heed these words and start feeding the minds and bodies of malnourished children! Our beloved educator might knit her eyebrows with concern to witness these starving souls being shoveled sawdust in the hallowed halls of school. I peer curiously at Charlotte, wondering whether or not she would see beneath the shiny veneer of the cutesy anecdotes, glossy illustrations, skeletal stories, and busywork of today's typical text books. Of course, she would notice they are merely dressier forms of pre-digested food. She might even sadly shake her head and observe "a child cannot in mind or body live upon tabloids however scientifically prepared." Vol. 6, pg. 109 Always one to seek scientific answers, she might liken textbooks to a diet of emerald shakes brimming with nutrients--healthy, but not satisfying for the soul. Scientists can manufacture fractionated vitamins in a lab, but this pap in a pill misses the vitality of whole food: trace ingredients, enzymes, amino acids, essential fatty acids, properly proportioned minerals, etc. Comparing infant formula to breast milk, she might note that textbooks may contain the minimum daily recommended requirements of facts, but cannot match the complex, perfectly balanced ingredients necessary for a developing brain. Charlotte's mind would reel as she witnessed starved minds ambushed by the burden of extracting knowledge from the downpour of twaddle found in most classrooms. She might compare it to the cost of extracting gold from rock, petroleum products from crude oil, or salt from sea water. "Professional teachers whether the writers of books or the givers of lessons, are too apt to present a single grain of pure knowledge in a whole gallon of talk, imposing upon the child the labour of discerning the grain and of extracting from the worthless flood." Vol. 1, pg. 175 Alas! If teachers only knew how much easier their jobs would be if they stopped orchestrating every moment of learning and foisting their overbearing personalities on their students. Perhaps they would feel guilty about collecting a paycheck since the only exertion required is to introduce children to the great minds of the ages and let their brains absorb those ideas which they find fit and nourishing. Hesitating to contribute my lowly thoughts, I quietly confess to Charlotte, "My heart soared with joy when I realized I did not have to rely on my meager talents. There is no need for me to create ingenious songs, stories, poems, and pictures or spend my precious time drafting cutting-edge lesson plans. I thank the Lord every day for your revolutionary ideas!" magnum opus, Charlotte might browse the reading lists in search of living books. She would thoughtfully ask why her search turned up dismal results and the librarian anxiously replies, "The children never read those. They don't care for the classics." As we stroll down the aisles of the school library, plain dusty books wait patiently for young eager hands to retrieve them from the shelves. Charlotte might be disappointed to find well-worn Disney-fried versions of Peter Pan and Pinocchio, instead of their heartier inspirations. Andrew Lang's contributions are virtually unrecognizable in the bland forms found in modern literature. Tanglewood Tales, Just So Stories, Parables from Nature, and Pilgrim's Progress, staples of Ambleside, have evaporated from the shelves. A smile brightens Charlotte's face when she encounters old friends like Jane Austen, Charles Dickens, and William Shakespeare. Her fingers enthusiastically leaf through the pages of Great Expectations, but a shadow crosses her face when she counts how little the book has been checked out in the past 15 years. "Only six times?" she mouths. Then she might turn to the librarian with pursed lips to ask for the most popular books among young people. Needless to say, she would not be impressed with the likes of R. L. Stine! Romans had the most dangerous sports, like chariot racing, and the most tragic sports, like gladiator fights. Sometimes the chariots broke and people fell. It reminds me of NASCAR, which is as dangerous because of the fiery car crashes. The gladiator fights were evil because men had to fight men or animals. The loser had to die if people put their thumbs down. Today we have boxing and wrestling, which started in Greece. When Xerxes found his way blocked by this ridiculously small band of soldiers, he sent his messengers ordering them to surrender, to give themselves up. What do you suppose Leonidas replied? It was what we should expect a Spartan to answer, brief and to the point; that is, Laconic. He said simply: "Come and take us." Still missing a few pieces of the educational puzzle, Charlotte might ask about how a child's progress is measured beyond those computerized tests full of impertinent questions. I explain that typical students are expected to write original compositions as early as first grade, complete worksheets and tests containing more impertinent questions, and occasionally discuss a book. She would inquire, "How often are young children expected to narrate a reading?" I truthfully tell her that I never narrated in school. My teachers usually monopolized most classroom discussions and, of course, kept us on track with impertinent questions followed by the right answers. Rather than retell, children are encouraged to express their feelings, opinions and moral beliefs from relative angles. She might respond, "We must disabuse our minds of the theory that the functions of education are in the main gymnastic, a continual drawing out without a corresponding act of putting in. The modern emphasis upon 'self-expression' has given new currency to this idea; we who know how little there is in us that we have not received that the most we can do is to give an original twist, a new application, to an idea that has been passed on to us; who recognise, humbly enough, that we are but torch bearers, passing on our light to the next as we received it from the last, even we invite children to 'express themselves.'" This fount of educational wisdom might beg my indulgence with one more question on how the Bible is taught in school today, from the original source or watered-down versions. I take a deep breathe and relate to her the misunderstood doctrine of separation between church and state. She would quietly lower her eyes to the folded hands in her lap. I briefly outline court precedence that bans school prayer, allows Christianity only to be taught during studies of world religions and forbids the use of the Bible as part of the curriculum. Charlotte might reflect, "We should not present Bible stories as carrying only the same moral sanction as the myths of ancient Greece; neither should we defer their introduction until the child has gone through a moral course of fairy tales and a moral course of fables." Vol. 2, pg. 108 I nod in agreement and point out that children are sometimes allowed religious self-expression through writing, slogans on T-shirts and class discussions. Christian teachers sow seeds of faith through these spontaneous opportunities. I describe how some atheists have tried to bar the little children from knowing God. A principal and superintendent in Pennsylvania unsuccessfully attempted to block a high school senior in Pennsylvania from including references to Jesus Christ in her graduation speech. Three students in Iowa are suing their school district because they were restricted from giving away Bibles after school. A federal court ruled that a high school choir in that same state could not sing "The Lord's Prayer" at a graduation ceremony. Even though the U.S. Supreme Court sided with a Bible club wanting access to public schools, a school district in California still bans the Good News Club although their policy allows non-Christian groups to meet after school to discuss educational, political, economic, cultural, artistic, and moral interests of their community. Charlotte might comfort me with words from our beloved Lord, "Rejoice, and be exceeding glad: for great is your reward in heaven: for so persecuted they the prophets which were before you." Our time together draws to an end, so I press Charlotte for her thoughts on two matters dear to my heart. I explain how I found a worthy example of the genesis of ideas and how it change a person's life. The biography of Temple Grandin, an autistic woman (who would have been called a backward child in Charlotte's day), describes how a simple idea struck her mind with such a force that she produced important revolutions in two seemingly unrelated industries: cattle management and therapies for autistic children. I began to unfold important events in Temple's life. While repairing a cattle chute at her aunt's ranch as a teen, Temple observed how wild-eyed nervous cows relaxed once squeezed gently by the sides of the chute. She wondered whether or not the chute could produce a similar effect on her own highly excitable nervous system. Trying out the equipment, she felt the same comfort as cows. Many adults in Temple's life--her teachers, her psychologist and even her parents--tried to steer her from this rather bizarre theory. Her sole supporter was her high school science teacher, Mr. Carlock, who encouraged her to investigate her ideas scientifically: build a human-sized model, experiment on other people, create a mechanism to enable the person to control its operation, and read research studies documenting the effects of tactile stimulation on humans and animals. In college, Temple worked hard to overcome her deplorable math skills, but was unable to major in engineering. However, due to her uncanny ability to design equipment visually, she bypassed the need for complicated physics and created a niche in the cattle industry. She applied her doctorate degree in animal behavior to predict the effects of her designs on cows and made innovative cattle chutes. Today, one-third of all cattle chutes used in the United States sprung from Temple's mind and autistic children all over the world are calmed by her "squeeze machine." I thank Charlotte for her insight and beg to impose upon her one more time before she returns to her life in Ambleside. While reading the biography of a beloved author, I was thrilled to noticed that his early education in childhood resembled a P.N.E.U. education. He grew up in the English countryside during the decade in which Ambleside thrived. I am eager to learn whether it was possible his teacher, that is his mother, inspired her son to literary greatness with a generous curriculum. Before I let the name J. R. R. Tolkien trickle off my tongue, our wise educator stopped me to avoid affecting the thought-atmosphere of his life in case she knew him. But Charlotte was curious to learn why I suspected an Ambleside method. I pointed out how his mother taught him to read at a tender age and introduced him to Latin. The lad seemed intrigued by the sounds and shapes of words, so she taught him French. He mastered several languages by himself and read The Iliad, The Aneid and even Danish sagas in their original tongues. He spent a great deal of time outdoors, sketching and learning botany through direct observation. The boy devoured many books considered standard at Ambleside: Alice in Wonderland, Treasure Island, and Andrew Lang's fairy tale collections. Even though his fertile mind rejected certain literary works (namely, Pilgrim's Progress and Shakespeare's plays), they lived in his curriculum. This Oxford scholar later relates that the times spent with his mother were the longest and most formative part of his life. Charlotte might recall Matthew Arnold's quote "Think clear, feel deep, bear fruit well" and ask me what were this man's fruits. I summarize his legacy. He became an Oxford professor who taught Old and Middle English. His recitations of Beowulf were so striking students fondly remember them years later. He translated ancient works into modern English, including his beloved Beowulf and Sir Gawain and the Green Knight. Through his knowledge of philology, he contributed to the Oxford dictionary. The achievement that endears him the most to literary minds is his creation of a mythical world in his books. He invented languages, described the fauna and flora, juxtaposed good against evil, and brightened his stories with poetry. This author breathed life into heroic characters who struggled with temptation, faced the consequences of spiritual weakness, enjoy the rewards of obedience, and put others before self. Most important of all, through his fellowship, another Oxford professor converted to Christianity and then wrote many apologetic books and Christian allegories still cherished today. 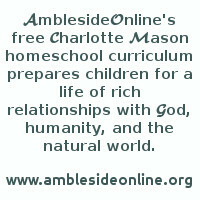 The Original Homeschool Series (six volumes) by Charlotte Mason Vol. 6, pg. 104-111; Vol. 1, pg. 171-178; Vol. 2, pg. 29-40. 1. Name and explain how some books or textbooks you use contain living ideas. 2. Illustrate the genesis of ideas using examples from your life or the life of others. 3. Illustrate how your children draw inspiration from casual life and thought-atmosphere. 4. Describe how to let your your children meet great minds. 5. Describe how to flower ideas that follow their own path in the minds of your children. Copyright Tammy Glaser 2002, Used with permission. Tammy created a page to show how CM's 20 Principles work in her homeschool; you can see that here.